Sarah Avner, our Cantorial Soloist, has been involved with music most of her life. This came as somewhat of a surprise -- though some in Sarah’s family were musical, her immediate family was not. Growing up in Canada, she attended music school from 5th-8th grade. In second grade she began begging her parents for a piano (as lessons could begin in third grade and she was jealous of her older cousin for playing). She felt most fortunate when her parents made the purchase of a 1903 Bell piano that had been painted baby blue by its original owners. It was a long summer watching her father take the piano apart, piece by piece, as he refinished it and brought it back to its original walnut finish. Sarah was in orchestra in 5th grade and played the cello. The cello could only be taken home on Winter Break, and you first had to pass a test by playing “Hot Crossed Buns”. She passed the test the first time. She played the violin, and stand-up bass as well. After graduating from Veterinary Technology school, Sarah moved to Austin in 1998, and while awaiting her papers (she was an illegal immigrant at the time) she volunteered at the synagogue office and sang in the High Holy Day Choir with then-Cantor Jaime Shpall. Between 1998 and 2003, Sarah would occasionally substitute for Cantor Shpall and loved doing it. When she got her work papers, she worked at some animal clinics, but gave it up when a secretary job opened at CBI, she applied and was hired. She took Hebrew, trope chanting class, and taught Sunday School. Sarah took several years hiatus from CBI when she moved with her family to Indiana where she was a stay-at-home mom to Jacob along with Zachary and then Rebekah. 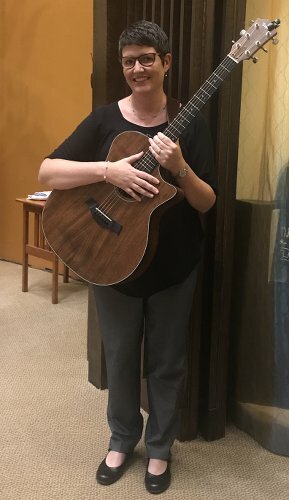 She also worked as the principal of the religious school at Congregation Adath B’nei Israel and decided it was time to pick up her guitar that had been collecting dust in a corner at home. These days, Sarah's goals include studying Biblical Hebrew, liturgy, and more repertoire. Sarah wishes to teach more music and keep music alive at CBI. For her, it is a gift to bring that to our congregation. There may be challenges with her job, but she works with an amazing staff where everyone supports one another. Rabbi Folberg is very compassionate and understanding, and leads by example. We are so happy to have Sarah lead the music and fill the sanctuary with her beautiful voice.